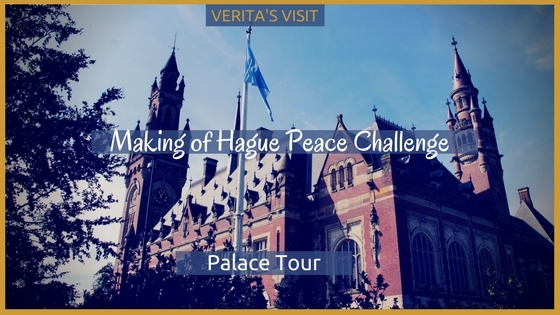 A Hague Peace Challenge wouldn’t be complete without a stop at the Peace Palace in The Hague. To come up with a good question and a creative assignment, I wanted to visit this mustsee in The Hague again, but I needed an incentive. Then my friend Jacqueline Alders, owner of I Guide you Through The Hague told me that the annual summer Peace Palace tours had started again. One of the main goals in my life is to find the exceptional, to get off the beaten track. A long time ago I worked for the Ministry of Foreign Affairs. One of the many departments organised a trip to the Peace Palace and, like many, I was curious to find out how the building looked from the inside. So, I went along. I remember beautiful objects, stained glasses, amazing decorations. if you haven’t done it: a guided tour through the Peace Palace is definitely worthwhile. There is no proof that I went inside; you are not allowed to take any pictures. This statue is a gift by Chile to the Peace Palace. It represents the women, children and elderly who suffer from war. There is a guided tour offered at the Peace Palace in which you are allowed to take pictures. It’s the guided tour through the garden of the Peace Palace. Our guide Roos – what’s in a name- not only told us about the flora and fauna, the landscaping and the statues, objects and plants that were given to the Peace Palace by the different nations. She also explained how shortly after the competition for the design of the Peace Palace, three garden architects were invited to compete against each other for the design of the grounds around the building. Thomas Mawson won the competition and became the designer. In an earlier post I have tried to define peace. Mawson associated peace with balance, harmony, symmetry, soft leaves and no thorns ( except for the roses), water. While walking through the garden I thought about the the base of the Hague Peace Challenge. imaginary situation of constructing a second City of Peace and Justice in the Middle East. I thought it would be interesting to integrate Mawson’s ideas in the design of the City or in The Hague Peace Challenge itself. If you are interested in visiting the gardens ( only in Dutch, on request in English) or the Peace Palace itself, use this link.